Anyone who’s ever read a Charlie Brown comic strip knows “Pig-Pen”, the lovable boy who walks around in a constant cloud of his own dirt and dust. Every time he sighs, dust rises in a little cloud around him. Why bother to bathe? There’s dignity in debris, which “Pig-Pen refers to as the “dust of countless ages”. Comets shuffle around the Sun surrounded by a similar cloud of grime that’s as old as the Solar System itself. You’ve probably noticed little flecks and streaks in photos returned by the Rosetta spacecraft in the blackness of space surrounding comet 67P/Churyumov-Gerasimenko. After a recent year-end break, the Rosetta team has returned with new updates on the comet including a series of four images recently released as a mosaic. The pictures were processed to highlight surface features; the space around the nucleus is black in comparison. But if we take a closer look at what first appears void, we soon discover it’s not empty at all. Using an image-editing tool like Photoshop, we can hold back the glare of the nucleus and “open up” the shadows around the comet. Jets of dust released by vaporizing ice are the most obvious features to emerge. The soft, low-contrast plumes plow into the vacuum around the nucleus wrapping it in a silky cocoon of gas and dust – a tenuous atmosphere that reflects sunlight far more weakly than the comet itself. While staring at dust spots may not produce the same magical feelings as watching a sunrise, it’s fascinating nonetheless to contemplate what we’re seeing. If you’ve been struck by the beauty of a comet’s meteor-like head trailing a wispy tail, you’re looking at what countless individual grains of dust can do when sculpted by the master hand of the Sun. Perusing images of 67P, we see the process in its infancy as individual grains and small clots are released into space to be fashioned into something grander. Rosetta’s Micro-Imaging Dust Analysis System or MIDAS measures the rate at which dust sweeps past the spacecraft and its size distribution. MIDAS catches dust grains by exposing a sticky target surface into space and waiting for a mote to drift by. It snatched its first one last November – a larger than expected mote measuring about 1/100 of a millimeter across with a complex shape and fluffy texture. COSIMA’s first dust grains. 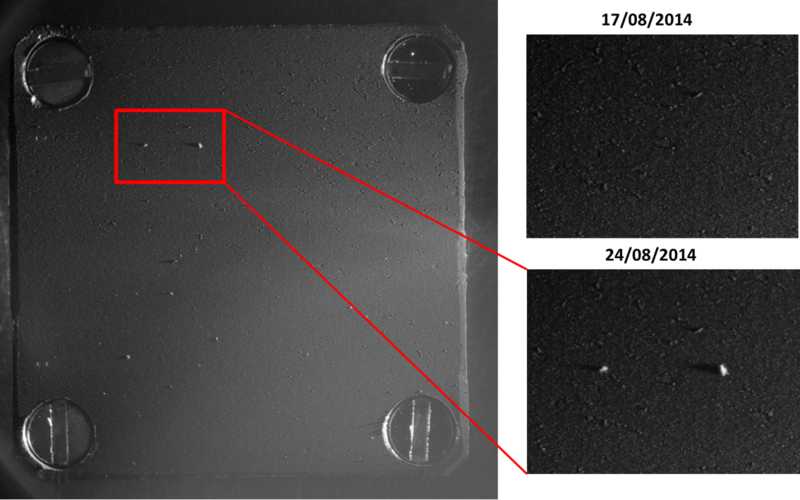 Left: an image of the target plate (measuring 1 cm by 1 cm) on which the grains were collected; right: a section of the plate showing it on August 17th (top) when no dust grains were visible and 24 August 24th (bottom) when two large dust grains were detected. The plate is illuminated from the right by LEDs, and the length of the shadows is proportional to the height of the dust grains. Analysis of the composition of another dust grain named “Boris” made by the COSIMA instrument has identified sodium and magnesium. Magnesium is no surprise as 95% of known minerals observed in comets resemble olivine and pyroxenes, common in meteorites and in the upper mantle of the Earth. Sodium has also been seen before in comas and tails, and originates in dust grains, but its mineral source remains uncertain. As we might study the makeup of the dust Pig-Pen leaves in his wake to identify traces of earthly dirt, micro-organisms, pollen, pollution, and even recent volcanic eruptions, so we examine each mote that sprays Rosetta’s way, looking for clues to the origin of the planets and Solar System. With the historic arrival of the European Space Agency’s (ESA) Rosetta spacecraft at destination Comet 67P/Churyumov-Gerasimenko flawlessly accomplished on August 6, 2014 after a decade long journey, ground breaking up close science at this bizarre world has begun while the team diligently and simultaneously searches for a landing site for the attached Philae comet lander. Rosetta started collecting cometary dust from the coma encircling the comet’s nucleus with the onboard COSIMA instrument on Sunday, August 10, 2014 as the spacecraft orbits around and ahead of the icy wanderer from a distance of approximately 100 kilometers (62 miles). See coma image below. COSIMA stands for Cometary Secondary Ion Mass Analyser and is one of Rosetta’s suite of 11 state-of-the-art science instruments with a combined mass of 165 kg. Its purpose is to conduct the first “in situ” analysis of the grains of dust particles emitted from the comets nucleus and determine their physical and chemical characteristics, including whether they are organic or inorganic – in essence what is cometary dust material made of and how it differs from the surface composition. COSIMA will collect the coma dust using 24 specially designed ‘target holders’ – the first of which was opened to study the comets environment on Aug. 10. Since the comet is not especially active right now, the team plans to keep the target holder open for at least a month and check the progress of any particle collections on a weekly basis. In fact the team says the coma environment “is still comparable to a high-quality cleanroom”at this time. But everyone expects that to change radically as Rosetta continues escorting Comet 67P as it loops around the sun, getting closer and warming the surface every day and until reaching perihelion in August 2015. COSIMA is managed by the Max Planck Institute for Solar System Research (Max-Planck-Institut für Sonnensystemforschung ) in Katlenburg-Lindau, Germany, with Principal Investigator Martin Hilchenbach. There are also substantial contributions from the Institut d’Astrophysique Spatiale in France, Finnish Meteorological Institute, Osterreichisches Forschungszentrum Seibersdorf and more. The target holders measure about one square centimeter and were developed by the Universität der Bundeswehr in Germany. The target will be illuminated by a pair of LED’s to find the dust particles. The particles will be analyzed by COSIMA’s built in mass spectrometer after being located on the target holder by the French supplied COSISCOPE microscopic camera and ionized by a beam of indium ions. The team expects any grains found on the first target to be analyzed by mid-September 2014. “COSIMA uses the method of Secondary Ion Mass Spectrometry. They will be fired at with a beam of Indium ions. This will spark individual ions (we say secondary ions) from their surfaces, which will then be analysed with COSIMA’s mass spectrometer,” according to a description from the COSIMA team. The mass spec has the capability to analyze the elemental composition in an atomic mass range of 1 to 4000 atomic mass units, determine isotopic abundances of some key elements, characterize organic components and functional groups, and conduct mineralic and petrographic characterization of the inorganic phases, all of which will inform as as never before about solar system chemistry. Comets are leftover remnants from the formation of the solar system. Scientists believe they delivered a vast quantity of water to Earth. They may have also seeded Earth with organic molecules – the building blocks of life as we know it. Any finding of organic molecules and their identification by COSIMA will be a major discovery for Rosetta and ESA and inform us about the origin of life on Earth. Data obtained so far from Rosetta’s VIRTIS instrument indicates the comets surface is too hot to be covered in ice and must instead have a dark, dusty crust.